What Is A Patio Cover? There are many different types of patio covers available. What is a patio cover? A patio cover is a shade structure for your backyard that is usually attached to the backside of your home. You can find patio covers in many different styles, shapes, and sizes. Also, there are different types of material patio covers can be made from with a range of different prices depending on the type of material you choose. 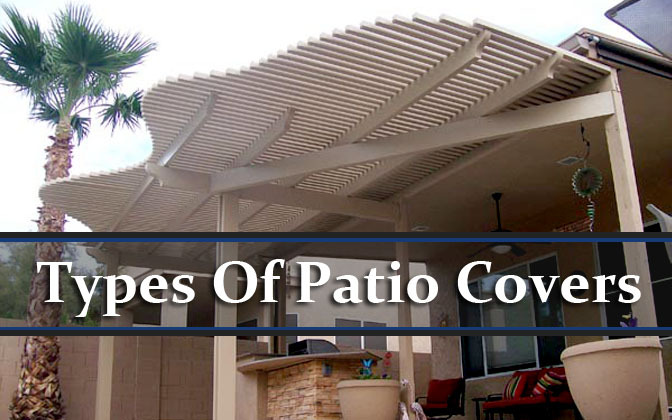 Other types of patio coverings include; Awnings, Retractable Patio Covers, Gazebos, Carports, and Pergolas. You can find outdoor patio covers in all kinds of shapes and styles, and they come in many different sizes, an of many different materials and prices. The permanent patio coverings would be pergolas, carports, gazebo, and awnings. There are some that are not as obtrusive, such as the ones with retractable cover that are made of fabric or vinyl, these are easily opened or closed at any time. They can have enough space for different activities, cooking, socializing, dinning, or simply taking it easy. You will be able to decorate your outdoor patio area however you wish too, and the entire family can enjoy their time outdoors. For example, you will be able to create seating enough for socializing, grilling, relaxing, and an area for a table with chairs to eat at. The possibilities for entertaining are infinite, depending on the amount of properly covered space you have. You can get metal patio covers, which are the most popular ones on the market today. Another type that is also popular are the wood patio covers, although not as durable and they do require more maintenance. Why Install A Patio Cover In My Backyard? Installing a patio cover in your backyard can expand your home into the outdoors, adding additional square feet to your backside of your house. 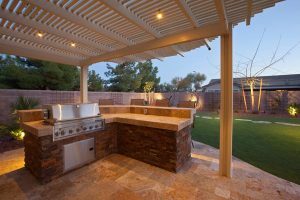 Patio covers set the perfect mood for outdoor activities like dining and cooking outdoors, relaxing, and socializing. You can also decorate your patio cover to give it a theme when planning a family dinner or holiday occasion. Even some diners and fast food places use restaurant patio covers as well. 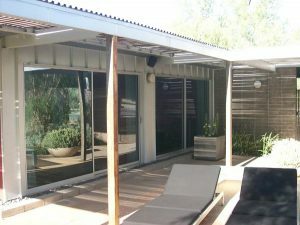 One of the most popular types of patio covers are metal patio covers which we will explore below. Metal Patio covers are the most durable and low maintenance type of patio cover available. Metal patio covers are easy to install and can be custom made in different sizes, shapes, and colors. They are also one of the most affordable types of patio covers available. Metal can resist harsh weather conditions and will not deteriorate like wood patio covers will. Metal patio covers are made from many types of metal materials with the one that is made the most and the most popular being made of aluminum materials. Patio covers made with aluminum are assembled easily, they are easy to install, and are available in several different sizes, styles, and colors. You can purchase these at a fairly reasonable price. This is a durable material that resists the conditions of the outdoors, whereas, other materials such as wood is going to deteriorate over a period of time. Wood materials would also be open to insects whereas, metal structure would not give you this problem. There is a material that is called ‘Alumawood‘ that is designed to give the look and feel of real wood, however, it is in fact made of metal on the inside. Homeowners that want the look of real wood but prefer the durability choose Alumawood patio covers. These are available in different styles, including awnings, carports, gazebos, and pergolas. You will also be able to locate a variety of types, shapes,sizes, and price ranges of Alumawood products at various websites online. If you want to have the real look of wood, durability, maintenance free patio covers, yet, get the benefits of having a metal product this is going to be an investment worth your while. Alumawood patio covers are made from a material that is meant to look like wood but is actually made out of metal. These patio covers are perfect for homeowners who want the look of wood but don’t want the maintenance involved with it. Alumawood is available in many different sizes, types, and shapes. It’s a great investment and you will not miss the maintenance of wood patio covers, which we will explore next. Even though wood patio covers will cost more maintenance, they are still a good choice for a lot of homeowners, especially homeowners whose home is built from wood material. For example, if you home was built using cedar wood, it is a smart idea to purchase patio covers that are made of similar wood to match your house. Wood covers also can be built in many shapes, materials, and sizes. Depending on the type of wood you choose, some materials may cost more than others. Wood that is being cut down faster that it can be replaced will be the most expensive. Wood that is sustainable will cost a little less. You can also choose eco-friendly wood to have your patio cover built with. Patio covers made with wood are still popular to homeowners who would like the materials to be consistent on the outside of the home. For example, if your home is made from cedar, you are more than likely going to want the other structures to also be of cedar. Patio covers made of wood are available in different shapes and sizes, and are made with several different types of materials. However, the price of wood covers is going to vary in price. There are materials that can be used which do not have any impacts on our environment, or very little. Of course, these do cost more. For instance, bamboo and maple are used as wood materials that are sustainable woods, this is due to its not being chopped down faster than it can grow back, or can be replaced with new ones. There are a lot of trees that are eco-friendly choices which are available today in the market. A good place to begin finding out more about sustainable wood and where you can locate structures made from these types of material would be on the internet. Of all outdoor wood structures, the most popular is the lattice patio covers which are also made from wood materials. There is a beauty about the intricate elegance in the work of lattice. Lattice structures are the number one choice in decorating the outdoor areas for many homeowners. 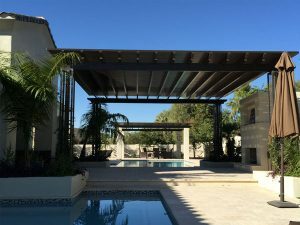 Places where a wooden lattice structure can serve as both, a space for division and privacy (where homeowners can relax without being totally in the open) would be things like the pool area, a garden area, and etc. Also, a lattice can be used for growing vines, climbing structures, and even growing vegetables, making the function of lattices more diverse. Lattice patio covers are usually made from wood materials and are the most popular type of patio cover design for outdoor structures. The beauty of lattice work is one of the best ways to decorate your backyard. The best areas to build lattice patio covers are by a pool, garden, or patio. This is also a way for homeowners to enjoy the outdoors in privacy. Climbing plants can be added to your lattice to give it a unique look and feel. View JLC’s Lattice Patio Cover Projects. Vinyl patio covers are another alternative to wood patio covers as they look like wood but are actually made out of plastic. Vinyl is perfect for outdoor structures because it is easy to clean, has very low maintenance and doesn’t dent easily. The best thing about vinyl is that is can be recycled and is considered environmentally friendly. Vinyl covering are one of the cheapest types of patio covers you can buy. Vinyl patio covers and Alumawood products are similar to one another. Whereas, the material of vinyl looks and feels much the same as wood, however, it is in fact, made from plastic. Requiring less maintenance and the vinyl structures work well outdoors. To keep your vinyl structures in great looking shape, simply wash them occasionally. They come in kits that are easy to assemble and have been designed to last for long periods of time just like metal products are, only they are not as expensive. Many of these its will also come with a guarantee, or your money back within a specific amount of time. Those who make vinyl products use more recycled materials more these days than they use to when making their products. Quickly becoming another one of those environmentally friendly products, vinyl is considered to be eco-friendly and it can be found through various websites online. It does not weight much, making the cost of shipping charges less, depending on the size pf its structure. You will find that there are a lot of manufacturers, as well as distributors of vinyl patio covers in the market today, which makes the price of each comparable to one another. Aluminum patio covers are the most popular type of metal patio cover. Aluminum Patio covers are the most durable and low maintenance type of patio cover available. Aluminum patio covers are easy to install and can be custom made in different sizes, shapes, and colors. They are also one of the most affordable types of patio covers available. Aluminum can resist harsh weather conditions and will not deteriorate like wood patio covers will. There are many different types of patio covers to choose from. 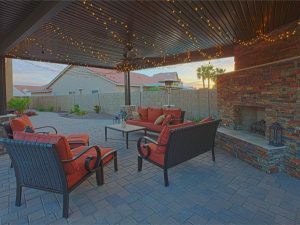 Weight out the advantages and disadvantages of each to find the perfect backyard patio cover for your home. 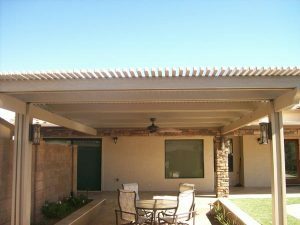 If you live in the Gilbert or Phoenix Arizona area and are interested in our patio cover installation services, give us a call at (480) 967-9183. 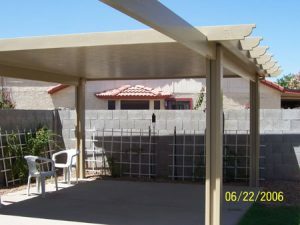 Read more about Phoenix Patio Covers and Gilbert Patio Covers.